Gender Issues in Science: What’s Different, What’s Not? Herbal supplements are big business. The industry has managed to maintain a “mom and pop” image to the public, the righteous underdog constantly under attack by Big Pharma. In reality, the herbal product industry is just another drug industry, one selling products that are poorly regulated and likely don’t work for their claimed indications. Allegedly invisible entities—popular belief notwithstanding—are indistinguishable from imaginary beings. Indian astrologers claim they can tell a person’s intelligence from his or her horoscope. But twenty-seven astrologers failed to perform better than chance when given forty horoscopes of intellectually bright subjects and mentally handicapped subjects. Help! I’m Being Followed by Ancient Aliens! The archaeological record shows clearly that our human ancestors were enormously intelligent and resourceful. They were more than capable of developing sophisticated technologies on their own. Skeptics often say they are trying to expose pseudoscience, but in reality we tend to use this term loosely. 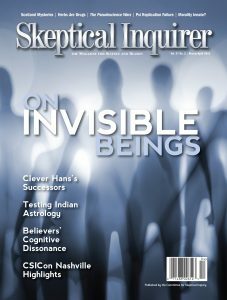 Creationism, homeopathy, alternative medicine, and cold fusion are clearly pseudoscientific, but what about ancient aliens, UFOs, alien abductions, Bigfoot, crystals, the Moon hoax, and many other claims investigated in the pages of the Skeptical Inquirer? The intent of Medusa’s Gaze and Vampire’s Bite is to provide scientific explanations for various monsters found in historical legend and literature up through the monsters of today as seen, mostly, in film. Had Kaplan succeeded in this task, he would have produced an exciting and interesting book.